Not because it’s not true (necessarily). It just doesn’t really tell you anything useful about the experience of parenting. My first issue is with the claim that parenting is “hard.” It’s way too vague. How is it hard? Is it actually physically straining? Is it difficult to figure out, like a complicated math equation? Moreover, I’ve always had a problem with people describing any normal life experience as “hard.”(In fact, I’ve written several posts critiquing the claim that “marriage is hard”). Because the question naturally arises: compared to what? Is life as a parent harder than . . . I don’t know . . . monastery life? Life as an Olympic diver? Life as an aging, single woman working for minimum wage at a mushroom farm? Life as an infertile couple? How can anyone judge? Life is hard, whether you get married or stay single; whether you have kids or you don’t. So to say that “parenting is hard” is meaningless at best and deceptive at worst. And then there’s the idea that parenting is “rewarding.” What does that mean? Is that referring to the sense of pride you feel when your child accomplishes something amazing? What if your child ends up in prison? Is it still rewarding? Or is the “reward” of parenting simply that incomparable, heart-stopping love you get to feel towards another human being? Personally, I’m uncomfortable attaching reward/punishment language to the experience of love between human souls, as if it were an economic exchange. And my last problem with the cliché is this: people say that parenting is “hard but rewarding” as if to say that there are good aspects to parenting despite the fact that it’s hard. But in my experience, parenting is satisfying exactly because it’s hard. That’s one of the great lessons. Parenting is not for the faint-hearted. Parenting is challenging, invigorating, stretching. I feel I’ve been growing by leaps and bounds ever since I had a child. Thanks to my daughter, I’m now twice the woman I was before I was given charge over her. I’ve discovered that there’s so much more to me than I ever could have imagined before I became a parent. So to resolve some of my discomfort with the ubiquitous cliché, I’m offering some of my own adjectives of parenting. Lord have mercy, there is nothing I can think of more inconvenient than having a child. When you have a kid, you can never just do what you want, when you want to. You always have to account for them, making sure their needs are being met. In the early years, you can’t even take a wee without thinking about what you’ll do about your kid. You can’t just go see a movie or run to the store to grab milk. You have to arrange everything. Children never stop making messes or needing you in some way. Again, especially in the early years, you almost never get a break. Except on the rare occasions when you arrange for babysitting, you are on constant call, 24 hours a day. For me, the greatest hardship — by far – has been the loss of alone time. I just can’t think when my kid is in the room . . . and she’s almost always in the room. I’ll just start to have a thought when she’ll spill her water or cry out or start climbing onto my lap. Then she’ll need a snack or the potty or a diaper change. Then she’ll beg me to read her a book or ask me to wrap her baby in a blanket or start shaking salt on the floor. And all this before 8 am. This is probably only very true of parenting today. There is just so much conflicting advice about how to best care for your child – to ensure that she’s well-fed, well-rested, sufficiently-stimulated, and feels loved. It’s so hard to know what’s right for your child. I have felt crushingly overwhelmed at times – do I try to enforce a routine, or focus on listening to her cues? Should I try harder with pushing vegetables, or focus on getting enough fats in her? Should I try harder to wean, or is it best to follow her lead? I find that my daughter makes almost every experience so much richer and more interesting because of her unique perspective. 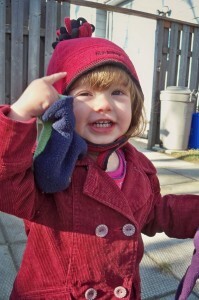 She notices things we adults don’t, and draws our attention to things we would otherwise overlook. All of a sudden, it’s the most interesting thing in the world that we can see the moon out the front window. Her complete lack of self-consciousness is charming and entertaining. Her excitement and enthusiasm for life are energizing. And as I said above, the experience of caring for a child has stretched me and challenged me in ways I never would have imagined, shaping me into a wiser, more compassionate, more patient person. Parenting has made me a better human being. How about you? What words would you use to describe parenting? What an awesome post. The first word that comes to mind for me is fulfilling. Only because I am being stretched (from the inside out!) and I am able to use gifts that I never knew I had. I don’t feel wasted at all: physically, emotionally, spiritually, every part of me is used up by the end of the day, and I am so glad that I can be needed and useful in all if these areas. But it’s really hard to get off the couch! Fantastic post! I love your observation and insight. I personally have never liked “parenting is hard by so encouraging” either or “raise up a child in the way they should go and when the grow older they will not depart from it”. But, your post is so spot on, highlighting on “hard” existences almost invalidated other “hard” existences. The words I would use to describe my experiences of motherhood would be: Funny: my kids make me laugh and we get each other’s goofy silly ways. Frustrating: I’m constantly hitting the same walls with my ten, seven, and six year olds and I need to remember to have mercy and grace for them. Humbling: I’m reminded of how much I need Jesus to show me how to be a peaceful, kind, gentle mom. I’m also humbled by the amount of love my children give even though I mess up…like constantly. I guess this one goes under humbling too, but I’m often reminded of the love of God as Father and (this is a bit edgy) but Mother. I see the parental, unconditional, transformative love of God in my life as I mother my kids. To think that the love i have for my kids is but a shadowy reflection of the love God has for me is humbling and satisfying. Thanks for a great post that’s reenergized me to be a faithful, Christ-like mother. 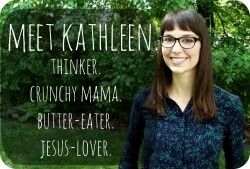 Blessings, Kathleen! Humbling: such an awesome responsibility, so many mistakes made along the way. Joy recently posted..Happy 5th Birthday Elisabeth! Sheri recently posted..This is not healthy. 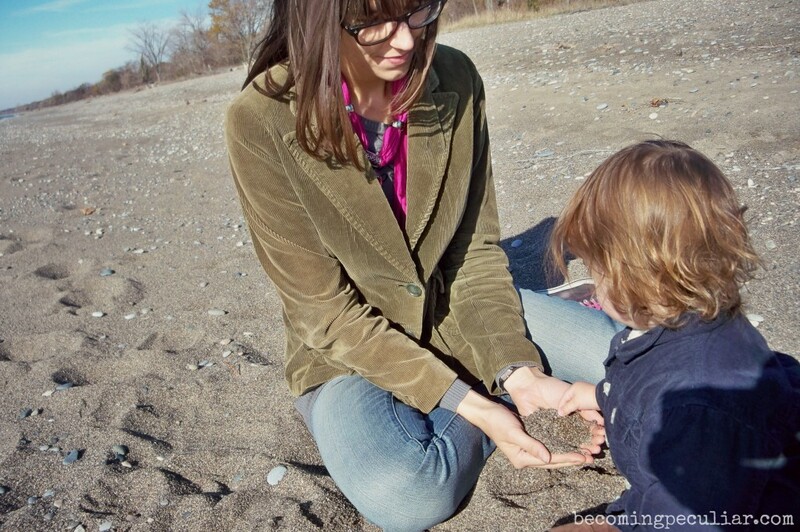 Parenting gets tedious, yet children keep life overwhelmingly fresh. Love this post! I think you really nailed it here. I think I would add INTENSE to your list, but that could be just my high-needs daughter. :) thanks for this post. It really made me smile and nod in agreement. You have such a way with words! I loved this! I’ve been struggling lately to describe this state of life right now because I always HATED this mantra before I had kids…and I couldn’t quite put my finger on why. Because a lot of things are “hard”! We need to be more descriptive! Unfortunately, the articulate side of my brain (or my whole brain?) doesn’t work quite the way it used to so I think that the word “hard” comes out first. Thanks for spelling out a list of alternatives that will hopefully come to my mind quicker so I can respond with less fumble and bumble :) Also, I would say that parenting gives purpose. Nothing in life has felt so meaningful, if mundane at times. However, I know that would have made me break into tears that “my life had no purpose” not too long ago so, I still struggle to find the correct words. As they get to be teens, these may likely refract into a million other emotions, some of which maybe things like “perplexing,” “isolating,” or “desperate.” Also “humbling” and “overwhelming” and “revealing.” Nothing made me want to be a better person than wanting to prevent my children from as much pain as possible, and nothing tore me more than letting go of them. What a thrilling ride! Great post! I totally agree with you (now that I’ve read the post). At first, I was like “what is she on about”, but you did make a lot of sense. “Life is hard, whether you get married or stay single…” – can I quote that from time to time?